Bubby and Bean ::: Living Creatively: Come Be a Part of Bubby and Bean in February! Come Be a Part of Bubby and Bean in February! In just a few short days, the first month of 2014 will come to an end. That means it's time for the official February sponsor call here at Bubby and Bean. If you have a shop, blog, Etsy store, or small business, I'd love for you to be a part of the blog next month! A Bubby and Bean Sponsorship is an affordable, effective way to promote your brand to several thousands of interested people every single day. In addition to promoting sponsors through their ads on all pages and posts here at Bubby and Bean, I work one on one with each advertiser to ensure that they are given optimum exposure through the blog and our social media channels. For more information on our various advertising packages, current stats, press, and pricing, visit our sponsor page right here. You can also book your ad space there directly in one click. There is currently a handful of spaces open in each size for February (except for XL, which is next available for April). All ad spaces are first come, first serve. 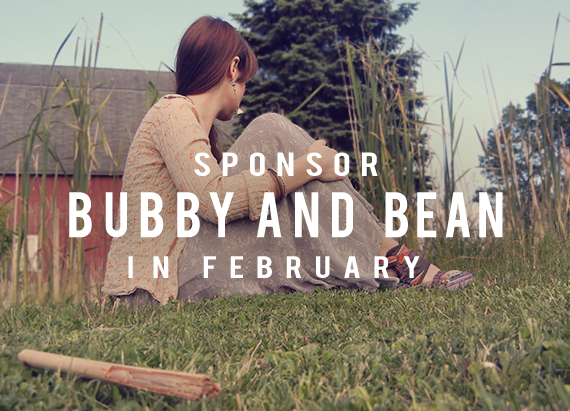 I've really enjoyed sponsoring Bubby and Bean, and I hope to sponsor again in the near future. For anyone considering...Melissa is so great to work with and you won't be disappointed! Thank you Kim! I've loved having you!